There are many reasons why you need a digital marketing strategy, like the fact that you may not have identified a unique value proposition that makes you stand out online. Digital marketing touches every aspect of your business and cannot be ignored. Social media, search engine optimisation and website analytics are just a few of the things you need to consider when building out your digital marketing plan. With the rapid pace that digital marketing is evolving, it becomes very difficult as a professional to prioritise things that deserve your attention. A digital marketing strategy will help you to set goals and KPIs on which to measure future success, help define what your online market share is and help you to defend that market share from competitors who want to gain traction online. A strategy can assist you in defining your online value proposition so you can differentiate yourself in the online space, and encourage existing customers and new ones to stay loyal. Another benefit of a digital strategy is that it helps you gain insights into your audience and also forces you to integrate your digital channels. You are also able to define the budget you want to dedicate to your digital marketing efforts with a clear strategy. This helps prevent you from wasting money on digital avenues that do not reap a positive ROI. Finally, a digital marketing strategy gives you the agility to adapt to new trends and to use updates to your advantage. As a result, you are continually updating your digital channels and platforms to keep up-to-date and staying ahead of your competition. Just consider that in 2017, TV ad spending will total $72.01bn. Meanwhile, total digital ad spending is going to equal $77.37bn, or 38.4% of total ad spending (eMarkerter 2017). AdWeek says that over one-third of CMOs believe that digital will account for 75% of marketing spend in the next five years. So, if you are not using a digital marketing strategy or improving your existing one then you are not taking full advantage of the digital marketing space. Way 1: Define your goals, specify KPIs and focus on conversions, not leads. When improving your digital marketing strategy, you need to clearly define your goals and objectives by mapping them out. 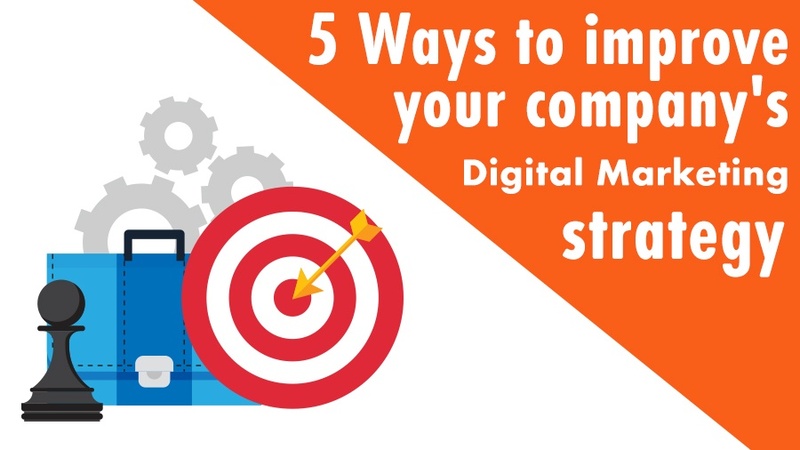 What do you want to achieve with your digital marketing campaigns and the overall strategy? Be SMART with your goals, as in specific, measurable, attainable, realistic and time-based. Specify that you want to create more brand awareness or drive website traffic. State the relevant metrics. Specify whether you are using impressions, click-through rate, engagement rate or website visits to define success. Define how long the campaign is running for and when you need to achieve your goals by. Think about all of these areas of concern and you will be able to improve your digital marketing strategy immensely. Look at your data via website analytics and understand every action and behavioural trait of your potential audience. You need to understand your potential customers and cast a wider net at first to attract prospects. But dig deeper; be specific with your targeting much like your SMART goals and focus on not only acquiring leads but also converting qualified leads into paying customers because, at the end of the day, it is conversions that are most profitable. Way 2: Knowing who and where your audience is. Create the ultimate journey for your customer. Understand who your audience is and where they are on your website, or what digital channels or social media platforms they are using. If you do not, then your digital marketing strategy is seriously lacking. Knowing your audience is a fundamental area of importance for your overall strategy. Look at your website analytics, social media analytics, and digital channel reporting. The more demographic information you have about your audience, the more effective your content marketing, email marketing, and other digital marketing communications will be. Your target audience needs to be part of every strategic decision you make. When you have all the data in place, you can then make informed decisions about the type of campaigns you should be running, on which platforms, with what targeting approach and for how much budget. With in-depth audience data, you can create a more effective buying journey for customers, and refine all the processes in your sales and marketing funnel. Way 3: Focus on quality of content over quantity. It is all about long-term value. The idea of quality over quantity applies to everything from design, to tweets and to content marketing. Think about it: posting less frequently and making sure the content you distribute is high-quality will be more effective than constantly spamming prospects with numerous calls to action and email newsletters. Releasing high-quality content guided by your digital marketing strategy sets the stage for creating an asset of long-term value on your website. The adage of “less is more” is so true when it comes to digital marketing. Before pouring resources into many different campaigns and just going crazy with your digital content, do research and see whether the returns justify the means. This applies to tools, solutions and other purchasing decisions as well. Think about long-term growth rather than short-term growth, because patience reaps a far more beneficial reward in the long run when it comes to digital marketing. Keep up-to-date with the latest digital marketing trends. Read up on what other companies in your business sector are doing, weigh up the pros and cons, and adapt accordingly. Consider new content forms that are on the rise, like video, which is seeing a 200 to 300% in click through rates this year alone. Knowledge is power and you need to be aware of all your options to make it big and be successful in the digital marketing arena. By doing research, you also make sure that your digital strategy is relevant and in-tune with the current landscape. Mobile is one of the biggest considerations in digital marketing and is especially relevant to your digital marketing strategy. In truth, your whole strategy should be mobile-first when you look at the number of internet users we have in the world today. Mobile internet users are on the rise as Smart Insights (2016) says that now 80% of internet users own a smartphone. If your website is not responsive and mobile-ready, you are putting yourself at a huge disadvantage. The above recommendations are excellent approaches to improving your digital marketing strategy. Not only does having a digital strategy make day-to-day business activities more structured, routine and measurable, it also streamlines your digital marketing process and your sales funnel. When you focus on adapting and improving your digital strategy, you make strides to stay in-touch with your target audience and appeal to their needs and issues. At the end of the day, all of this leads to more qualified leads and conversions.